A brake controller is designed to activate the trailer's electric brakes along with the tow vehicle's applied brakes to stop both as proportionately as possible. There are Three styles of brake controllers; Time Delayed, Inertia Activated, and Proportional. First up are user friendly Time Delayed Brake Controllers. They operate by reacting to the slowing tow vehicle. Once pressure is applied to the brake pedal the predetermined amount of braking power is also applied to the trailer's braking system, enabling a more harmonious slowing and stopping of the vehicle and trailer. The amount of power to be applied is set by the user and is based on the weight of the trailer. With this type of brake controller a delay always exists and even continues to persist after using a sync switch which is usually available on time delayed controllers. The Sync switch allows for delay adjustments, shortening or lengthening the time it takes for the controller to react and apply the power needed to bring the vehicle and trailer to some degree of unison. Although braking nearly occurs together one of the two involved in the tow will be acting more to achieve the stop which will most likely result in uneven brake wear. Time Delayed Brake controllers can be mounted in any place imaginable and will still operate. Inertia Activated Brake Controllers are second on the list of the 3 styles and are the most popular. These brake controllers have a similar function to timing activated controllers except the inertia controllers utilize a pendulum sensor that senses the vehicle's deceleration inertia and then applies the brakes accordingly, meaning, at the same rate, it proportionally stops the vehicle. Inertia Activated Brake Controllers are required to be mounted with degree precision and perform best in level areas. Some models include digital displays and direct plug in. The final type of brake controllers, Proportional Brake Controllers, are discussed just after the selection of Time Delayed Brake & Inertia Activated Brake Controllers. This is the most advanced and intelligent brake controller. It stops your towed trailer with ease and without effort. No manual leveling needed as Prodigy constantly adjusts itself to the position of the tow vehicle. Also, self-adjusting to various types of terrain as you drive. This hassle-less advance in proportional braking is designed to work with electric over hydraulic trailer brakes. Which, in turn, provides a proportional stop according to the vehicle's deceleration rate. Reversing is proportional as well and has the ability to be disabled when it isn't needed. 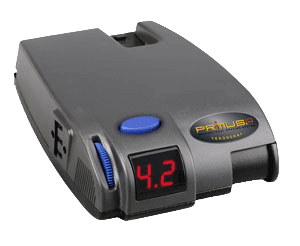 reverse battery protection for both vehicle and breakaway systems. Multiple mounting options including 360 degree vertical rotation. 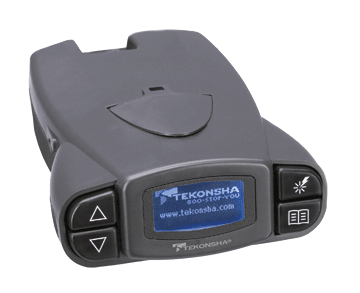 A breakthrough amongst proportional trailer brake controllers is the Tekonsha P3. Offered is a system that's smooth and proportional. Provided, is a multi-functioning LCD display that features the most advanced diagnostics which can be used with ease. The P3's innovative capabilities, such as switching from an electric brake system to a hydraulic brake system or vis-versa, were driven by consumer preference. 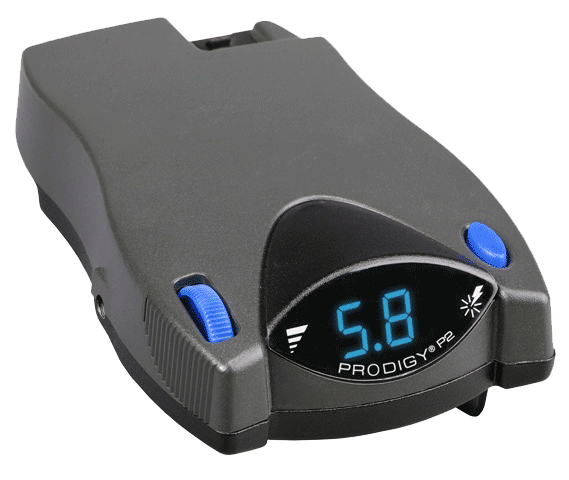 Utilizing the Prodigy's primary sensor technology, Now included with the Primus IQ is the "Boost" feature that allows the user to apply more inital trailer braking while towing that of more weight. Backing into tough spots is much easier with the Primus IQ which offers proportinal braking while in reverse. Also included is a snap-in dash mounting clip and removable electrical connector which allows for quick storage while not being used. Appreciation may be given to the digital readout that is used to convey a secure electrical connection, the amount of voltage delivered to the trialer brakes as well as the diagnostic features integrated within the LED display. 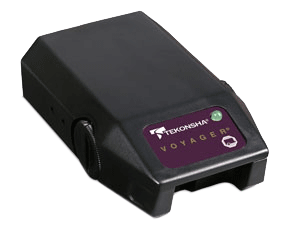 Tekonsha's patented braking sensor is used by the Voyager for smooth and secure trailer braking. It's compact size is convenient with such features as a bi-colored LED brake monitor assuring a secured connection to trailer brakes and indicating relative braking power being applied. This makes the Voyager rather versatile. Interference is minimized with tow vehicle electrical systems, a four-wire attachment is used, with a broad range of settings and is compatible with most vehicles. Here, we have arrived at the more desired brake control system, which was mentioned previously. Lets discuss the major differences this device provides that the afore mentioned doesn't. Proportional braking has a distinct advantage over "on-or-off" systems, which brake at one preset level, no matter how hard the coach stops. 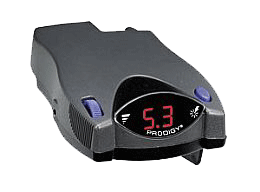 A motion sensing or proportional brake controller can easily sense how fast a trailer’s tow vehicle is moving to a stop and provides an equal amount of power to the trailer's brakes. This type of controller provides proportional balanced braking and is most suitable for trailers that are relatively heavy and travel long distances.This controller optimizes braking as both trailer and tow vehicle’s brakes stop in unison, whereas a time delayed or solid state functioning brake control system, depending on the pre-determined settings, either the truck/ tow vehicle or the trailer using does the greater braking power that results in an uneven brake lining wear. Proportional brake control provides the least wear and tear on the tow vehicle and trailer's brakes and provides the fastest and smoothest braking. Time Delayed or Solid Sate Brake Controller Type does not provide an efficient source of balanced braking application for a tow vehicle and trailer unit. Also, in a panic braking situation, they provide little trailer braking during the first critical seconds, whereas motion sensing or pendulum brake control systems immediately act by applying proportional balanced braking. Below are a variety of this particular type of brake control system that may interest you. 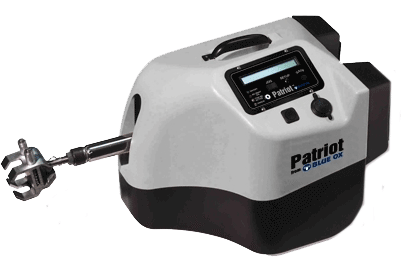 Blue Ox offers the Patriot which gives you the comfort needed when you are braking your tow vehicle. It's just as convenient as it is easy to store. While slowing to a stop this brake controller proportionally applies the brakes smoothly, compleletly eliminating sudden jolting to your tow vehicle avoiding costly damage to your brakes as well as a potential accident. The Patriot is Hybrid compliant! 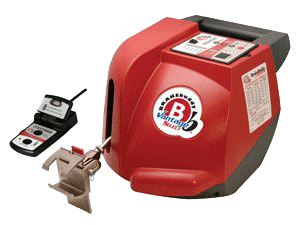 This braking systems includes a one year warranty as do all Blue Ox braking systems. No more wires Monitor all brake functions or manually apply brakes from the comfort of the driver seat through a wireless remote control that continuously communicates with the braking system. No more power concerns Built in battery ensures power is always available to the brake. 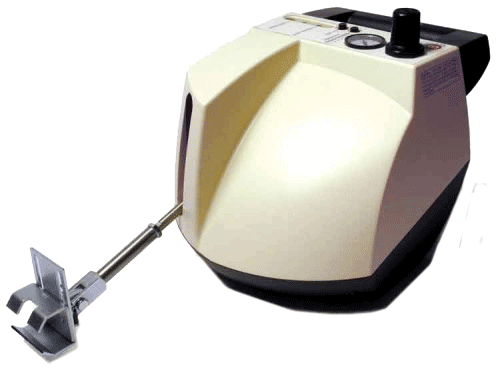 No more mess By using an electric cylinder there are no air pumps, storage tanks or hoses; therefore there is no chance for leaking and greatly reduces power required. Allowing the choice between full and proportional braking at the touch of a button is the only portable auxiliary braking system. Whether it be a preference or a switch between modes to accomodate for current driving conditions only the Vantage Select provides the option to choose. The power is at your fingertips with a wireless diagnostic remote which not only gives the choice between braking modes but offers sensitivity settings so adjustments can be made "on-the-fly" from the coach. It also notifies you of the braking mode, a breakaway situation, and diagnostics information. Push a button and the Vantage Select prepares itself for use. the BrakeBuddy Break-Away System will apply the brakes of the towed vehicle bringing it to a controlled stop. Monitor all brake functions or manually apply brakes from the comfort of the driver seat through a wireless remote control that continuously communicates with the braking system. 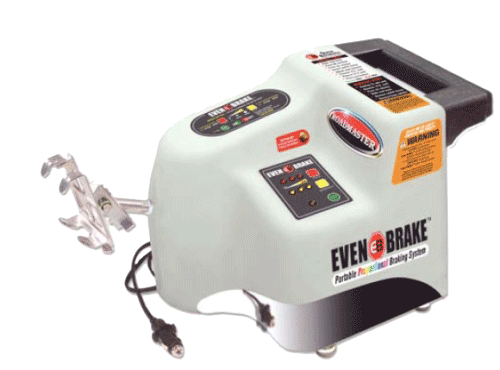 The world's only portable proportional towed car braking system is brought to you by Even Brake. Braking pressure is automatically increased or decreased in direct proportion to the coach. Essentially, it evenly brakes at the same time, and at the same intensity, as the coach is braked. Proportional braking Proportional braking is even braking your towed cars brakes respond to your motorhomes brakes, at the same time and at the same intensity. Constant self-diagnostic testing Even Brake monitors its own performance constantly, and any change in system status is transmitted to the motorhome monitor. Even Brake is the only supplemental braking system that checks itself, so you don't have to a glance at the monitor assures you that Even Brake is fully operational. "Power Save" low battery protection Even Brake warns you of a low battery in the towed vehicle with LED and LCD alerts at the motorhome monitor, giving you time to recharge the battery. If the battery's voltage drops too low, Even Brake cuts power to the system, while retaining emergency braking power. Automatically delivers maximum braking pressure in an emergency or a break away situation Even Brake works the most when you need it the most. Emergency break away system included brings your vehicle to a controlled stop should it ever separate from your motorhome. Dedication through towing safety by providing the best and most comprehensive supplementary braking system, BrakeBuddy’s technology provides adequate braking force when needed, as well as advanced terrain sensing capabilities. Once the brakes are applied, the BrakeBuddy senses vehicle deceleration and applies the brakes, simultaneously slowing the vehicle and towed load. Protecting your investment and others on the roadway is The Breakaway System. In the event your towed vehicle separates, the breakaway system will automatically apply the brakes, bringing it to a controlled stop. This prevenative measure helps to eliminate potential harm to others as well as costly damage to your investment. No connections to your motor home. No alterations to your towed vehicle. Guarantee/Warranty 30-day money back guarantee and a three-year warranty on parts and labor. Size: 9" x 11" x 14"
Copyright © 2009 Brake Control. All rights reserved.